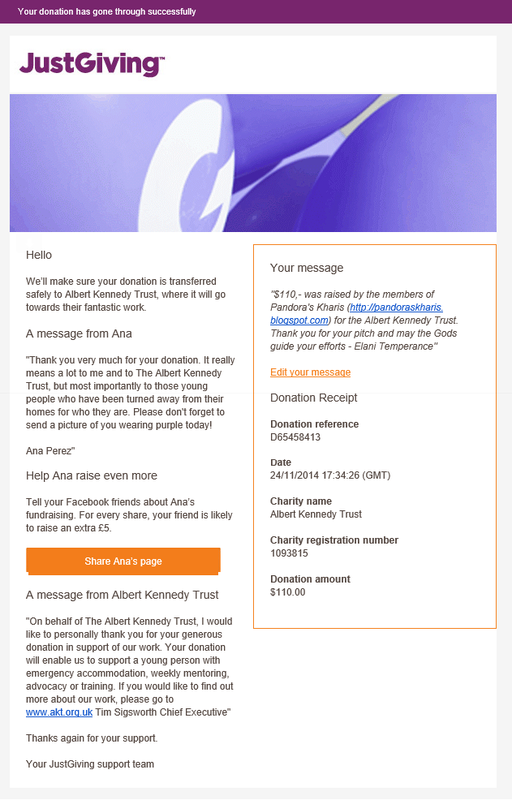 Members of Pandora's Kharis have come together to raise $110,- for the Albert Kennedy Trust. Since 1989, Albert Kennedy Trust has supported Lesbian, Gay, Bisexual and Trans (LGBT) young people (up to 25 year old) who are homeless or living in a hostile environment in London, Manchester and Newcastle. Their services include supported lodgings, mentoring, training and advice & guidance. The cause was suggested by community member Ana Perez, who is currently holding a fundraiser for it, to which Pandora's Kharis has donated. With 64% of the votes, the Albert Kennedy Trust became the Maimakterion 2014 cause for Pandora's Kharis! The Metro CareRing and the Street Angels Hawaii both got 18% of the votes. Since 1989, Albert Kennedy Trust has supported Lesbian, Gay, Bisexual and Trans (LGBT) young people (up to 25 year old) who are homeless or living in a hostile environment in London, Manchester and Newcastle. Their services include supported lodgings, mentoring, training and advice & guidance. The cause was suggested by community member Ana Perez, who is currently holding a fundraiser for it. AKT also provides bespoke training for housing, social care, support, fostering and adoption organisations. We are the experts in this field and once an organisation meets the standard required for supporting LGBT young people we reward them with the Albert Kennedy Trust Quality Mark. This mark shows you that the organisation that is caring for you knows how to in the best way possible. 85% of our young people have faced some level of rejection by their parents just for being brave enough to come out and be who they are. Many young people will not use mainstream provision for fear of homophobia or transphobia from other service users or even the service itself. 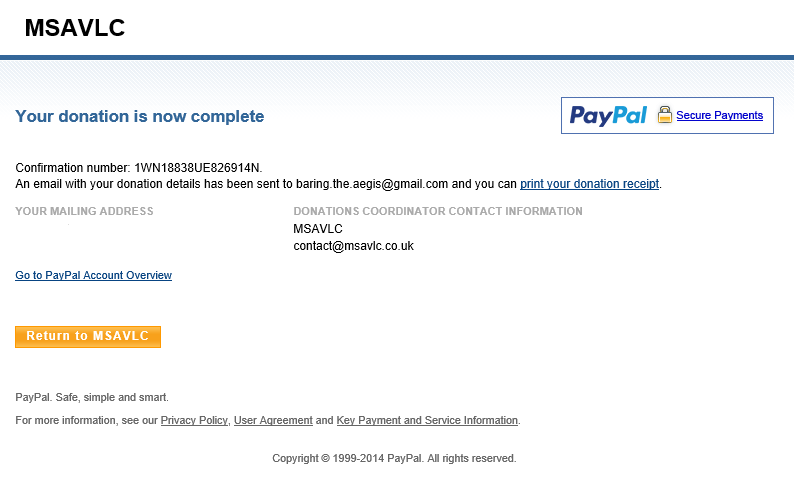 You can now donate to Pandora's Kharis at baring.the.aegis@gmail.com or by clicking the 'donate' button to the side. Please, give generously to support this wonderful cause, and thank you in advance! The deadline to donate is 24 November, 2014. For Maimakterion, there are three worthy causes to pick from, submitted by our members. They are the Albert Kennedy Trust, the Metro CareRing, and Street Angels Hawaii. Since 1989, Albert Kennedy Trust has supported Lesbian, Gay, Bisexual and Trans (LGBT) young people (up to 25 year old) who are homeless or living in a hostile environment in London, Manchster and Newcastle. Their services include supported lodgings, mentoring, training and advice & guidance. The cause was suggested by community member Ana Perez, who is currently holding a fundraiser for it. Metro CareRing operates one of Denver’s largest hunger-relief programs, including a fresh foods shopping market, teaching garden, and weekly healthy living and nutrition classes. Situated in the heart of Denver, Metro CareRing distributes between 4,000 to 6,000 pounds of food, baby items, and personal care products in helping to meet the nutritional and health needs of up to 500 people every day. Metro CareRing takes a progressive approach in developing self-sufficiency programs and offering opportunities for participants to learn about healthy habits and develop assets-based goals. Metro CareRing is also one of the area’s leading non-profits in the ID Partnership and helps with utilities assistance. Thanks to 170 volunteers weekly, Metro CareRing is a beacon of hope for Denver's hungry families and individuals. The Street Angel project is an experience that connects neighbours in heartfelt ways that inspire everyone engaged. They are a family of interested people, 100% volunteer based, sharing home cooked healthy vegetarian meals, good cheer, clothes and supplies, creative possibilities, and encouragement to neighbours in their city who are sleeping under bushes or living in shelters. The deadline for voting is November 11th, but of course you are also free to start making your donations today. 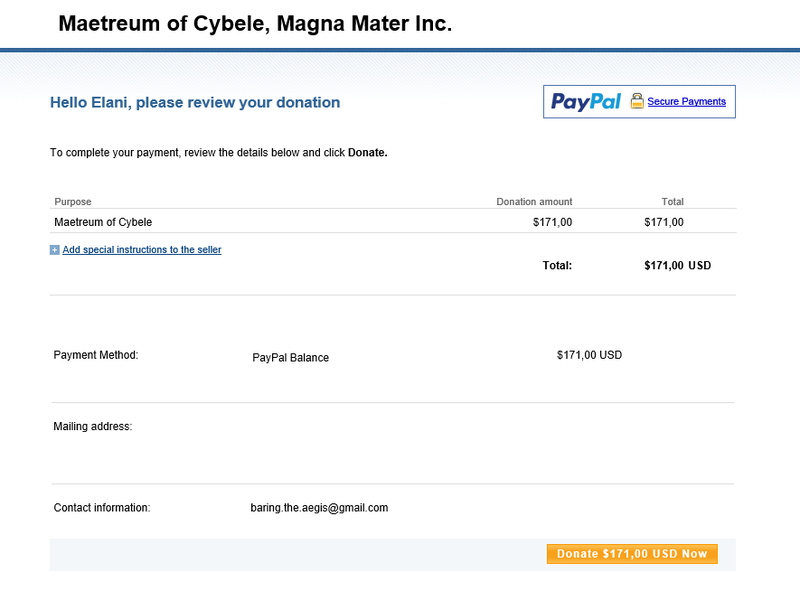 Members of Pandora's Kharis have come together to raise $171,- for the Maetreum of Cybele. The Maetreum of Cybele, a Pagan temple and convent located in upstate New York, is a non-profit organisation which has been struggling against the city of Catskill in an ongoing tax-battle, and we have come together to at least help their cause a little. By unanimous vote, the Maetreum of Cybele is Pandora's Kharis' Boedromion 2014 cause. The Maetreum of Cybele, a Pagan temple and convent located in upstate New York, is a non-profit organisation which has been struggling against the city of Catskill in an ongoing tax-battle. "The legal issue at hand is if the Maetreum uses its property primarily for religious purposes, which would exempt them from paying property taxes. The Town of Catskill says the group is an “illegitimate religion” and is using the property for residential, rather than religious uses. The Maetreum says the town doesn’t want to “open the floodgates” to other nonprofit groups claiming tax exemptions which deprives the town of tax revenue. Despite the unanimous decision in 2013 by a three judge panel of the Appellate Division of New York’s Supreme Court favorable to the Maetreum, the Town of Catskill took the unusual step of appealing the ruling to the New York State Court of Appeals. A ruling by the Court of Appeals is expected later this Fall and the Maetrum expects it to uphold the previous decision that the Maetreum is a religious nonprofit and as such is exempt from paying property taxes. Catskill also recently filed charges against the Maetreum for refusing to allow a municipal inspection to look for code violations and a trial is now scheduled for late September. The Maetreum, in an effort to preserve their property rights while the September trail takes place, filed suit against the town’s attempt to use property codes to condemn and foreclose on the property in the Greene County Supreme Court of New York. The town may finally be successful. If the Maetreum can’t raise $10,000 in the next few weeks to cover legal fees for the appeal, the Pagan convent may close." "That the Divine Feminine principle is the basis of the universe. That all of us, all that we encounter is Her in the aggregate. We are all the Great Mother learning about Herself. From this simple beginning springs our organizational models, our rituals, the principles of what we call Wholistic Feminism, our mission of charitable outreach and indeed the way we, as Cybelines, live our lives. We are sometimes called the 'scholarly Cybelines' because we have invested many years of strict historical research in order to embrace the essence of what proved to be literally the oldest surviving religion in the world. We embraced the essence and then stepped away from "Pagan Reconstructism" by bringing those essences into the modern world. We re-introduced to the world a model for Pagan Monasticism. We've recovered long believed lost principles, our drumming patterns, ritual practices and corrected history. The world centre of our Religion is in the Catskill Mountains of upstate New York at the foot of the Kaaterskill Clove. Unlike many neo-Pagan groups, we have a "horizontal" organization, our Priestesses all considered equals but also expected to live our religion, dedicate themselves to a live of charitable works and ministry to others according to their strengths. We welcome all to our services and to visit our first Phrygianum of the modern era. We do not require anyone to renounce anything to join us." This organisation is in danger of going bankrupt, and we would like to help prevent this from happening. 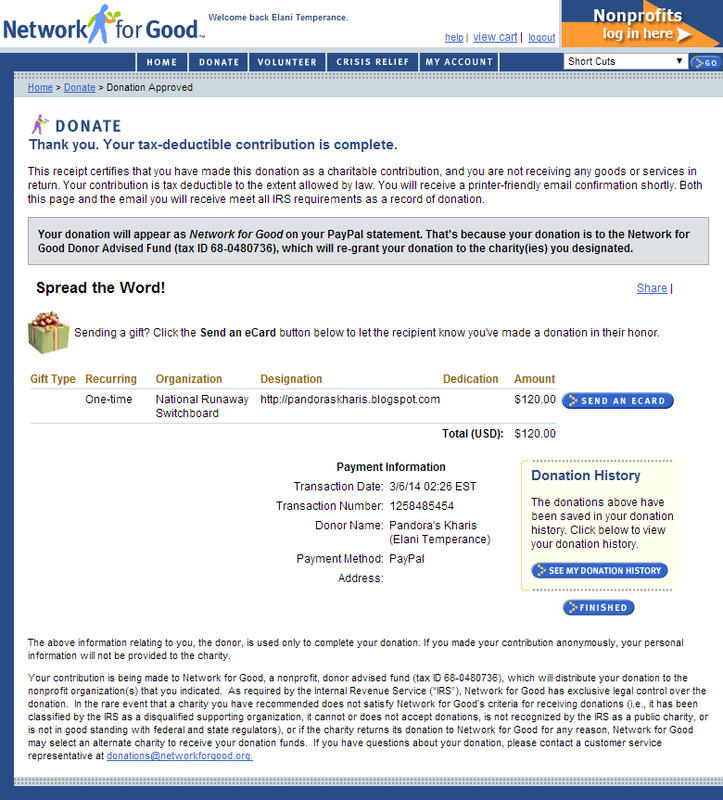 You can now donate to Pandora's Kharis at baring.the.aegis@gmail.com or by clicking the 'donate' button to the side. Thank you in advance for any amount you can spare. It will matter. The deadline to donate is 26 September, 2014. With 75% of the votes, Plan International became Thargelion 2014 cause for Pandora's Kharis last week, and this time around, $110,- was raised for the cause. That is a beautiful number, especially when you know that, for example, for about $5,-, a child can get sight treatment, meaning screening and glasses or medicine. Plan is a child-centred community development organisation, and one of the oldest and largest children's development organisations in the world. They work with children, their families, communities, organisations and local governments to bring about positive change, and they are active in 50 developing countries across Africa, Asia and the Americas to promote child rights and lift millions of children out of poverty. participate fully in family, cultural and social life. Listening to what children have to say about their rights, needs and concerns is key to this approach. They encourage and help children to take an active role in finding solutions to their problems and realising their full potential. As always, Elaion is very proud to make an announcement of the generosity of our members. Especially at a time where many people are struggling financially, we still get donations that average out around $20,-. We are very grateful to every single person who made a donation--big or small--and helps us make a difference. As always, we encourage members who have given so generously to dedicate this gift to the Gods, especially the Kourotrophos; (mostly) female deities who watched over growing children--Gaea, Artemis, Hekate, Eirênê, Aglauros and Pandrosos, especially. A pre-made ritual can be found here, on the Elaion Facebook page. With 75% of the votes, Plan International became Thargelion 2014 cause for Pandora's Kharis! Founded over 75 years ago, Plan is one of the oldest and largest children's development organisations in the world. They work in 50 developing countries across Africa, Asia and the Americas to promote child rights and lift millions of children out of poverty. In 2013, Plan worked with 78 million children in 90,229 communities. Plan is independent, with no religious, political or governmental affiliations. You can now donate to Pandora's Kharis at baring.the.aegis@gmail.com or by clicking the 'donate' button to the side. Please, give generously to support this wonderful cause, and thank you in advance! 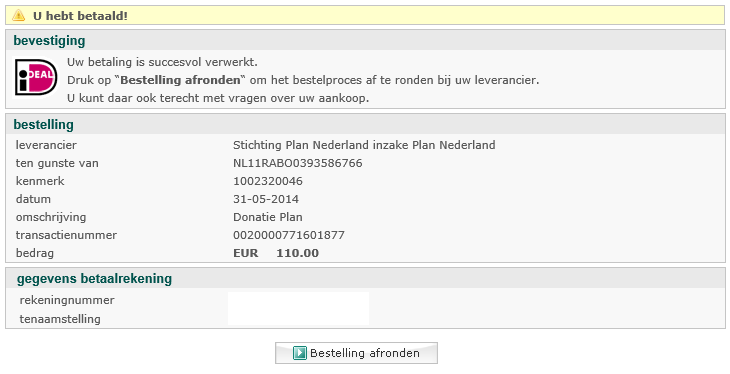 The deadline to donate is 30 May, 2014. It's going to be a hard pick this month: two very worthy causes have been entered into the race for Thargelion 2014 cause: UNICEF and Plan International. We are starting to notice we really like causes that support children around the globe, and for a religion which was founded in a society where children were of the uttermost importance, that's not really odd to us. They believe that nurturing and caring for children are the cornerstones of human progress. UNICEF was created with this purpose in mind – to work with others to overcome the obstacles that poverty, violence, disease and discrimination place in a child’s path. They believe that we can, together, advance the cause of humanity. They advocate for measures to give children the best start in life, because proper care at the youngest age forms the strongest foundation for a person’s future. They promote girls’ education – ensuring that they complete primary education as a minimum – because it benefits all children, both girls and boys. Girls who are educated grow up to become better thinkers, better citizens, and better parents to their own children. They act so that all children are immunized against common childhood diseases, and are well nourished, because it is wrong for a child to suffer or die from a preventable illness. Founded over 75 years ago, Plan is one of the oldest and largest children's development organisations in the world. They work in 50 developing countries across Africa, Asia and the Americas to promote child rights and lift millions of children out of poverty. In 2013, Plan worked with 78 million children in 90,229 communities. Plan is independent, with no religious, political or governmental affiliations. As you can see, we have two very worthy causes to choose from this month. The deadline for voting is May 25th, but of course you are also free to start making your donations today. 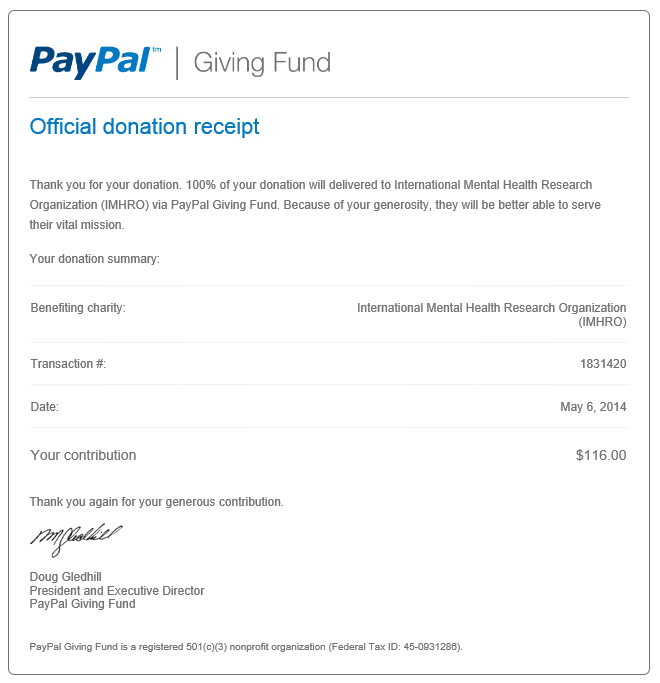 With another successful donation run, we have raised $116,- for the International Mental Health Research Organization! The money we have donated as a giving circle today has helped aid that purpose, and Elaion could not be prouder! From this moment on, the Pandora's Kharis Facebook page is open to pitches. If you do not have Facebook, feel free to pitch your cause in the comments. We will relay the message to the community. On to another month of pitching, voting, and giving. Thank you for your generosity! It is our great pleasure to announce the Elaphebolion 2014 nominees for charity of the month. One of the following causes will receive this month's donations made by members of Pandora's Kharis. We would like to thank every community member who stood up to pitch their pick for a cause and as our numbers keep growing, we hope for even more causes to choose from next month. The Wounded Warrior Project aims to raise awareness and enlist the public's aid for the needs of injured service members, helps injured service members aid and assist each other, and provides unique, direct programs and services to meet the needs of injured service members. Metro CareRing operates one of Denver’s largest hunger-relief programs, including a fresh foods shopping market, teaching garden, and weekly healthy living and nutrition classes. Instead of receiving a pre-packed or standard bag of groceries, families can shop for free at the Metro CareRing Market. A self-select shopping model gives participants more control over their food choices, exposes them to new foods, and reduces waste. Volunteer Personal Shoppers help participants choose their food, respectfully presenting healthy food options, and guiding them toward preparing nutritionally balanced meals. Do you have a favourite out of these five? Vote for your favourite in our poll. If you would like to donate to any of these, or have other causes to pitch for next month? Come join us as well! We will announce this month's winner on March 24, 2014. Elaion is proud to announce that the fifth Pandora's Kharis donation run has raised $120,- for our democratically decided upon cause the National Runaway Safeline. 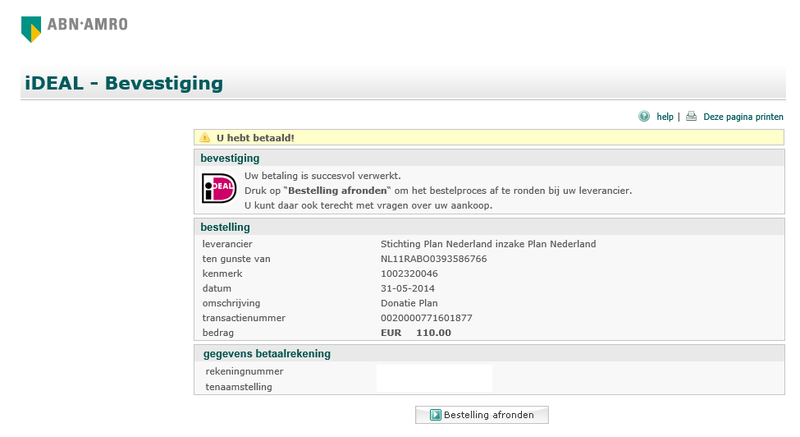 I am once more very happy to say you have all given generously, and in the spirit of the Gods! 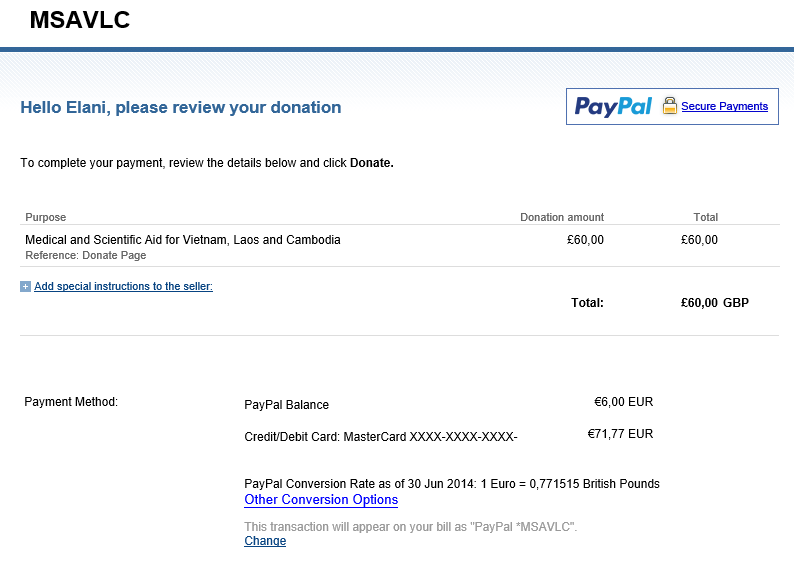 PayPal takes its standard fees from the transactions, in this case about $8,-, which was covered by Elaion, making sure every cent of your donation went to the Switchboard. The average amount paid by the contributors was around $20,-, with donations coming in as high as $40,-. By a large margin, Greek Non-profit Foundation Desmos has been elected as Gamelion 2014 cause for Pandora's Kharis. Desmos was established by a team of young, dynamic individuals sharing a common vision to responsibly and effectively address the imminent social and humanitarian crisis in Greece through collaboration and the involvement of the private sector. Desmos utilizes surplus products and services to meet the basic needs of vulnerable groups and individuals. With one phonecall or an email to Desmos, you can communicate your offer or your need, and enter into a dynamic network. Desmos won with 71 percent of the votes. The Pandora's Kharis PayPal account is once more open to receive donations, and can be accessed in the right hand sidebar. The deadline to donate is February 1, 2014. 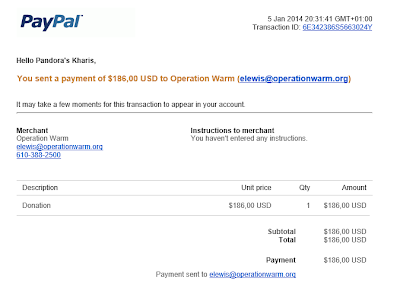 All PayPal costs will be covered by Elaion so your full donation will be transferred to Desmos. 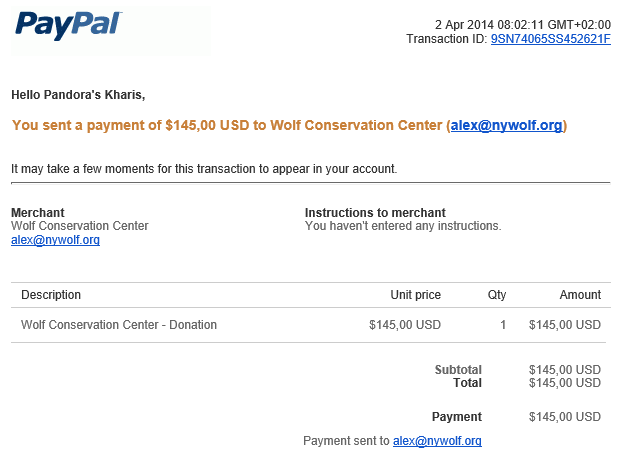 Thank you in advance for your donation, for spreading the word, and/or aiding the cause in any other way. Elaion is proud to announce that the third Pandora's Kharis donation run has raised $186,- for our democratically decided upon cause Coats For Kids Foundation. Once more, it is an astounding amount for a small but ever-expanding giving circle, and we are so proud of the generous spirit of the Hellenistic community. 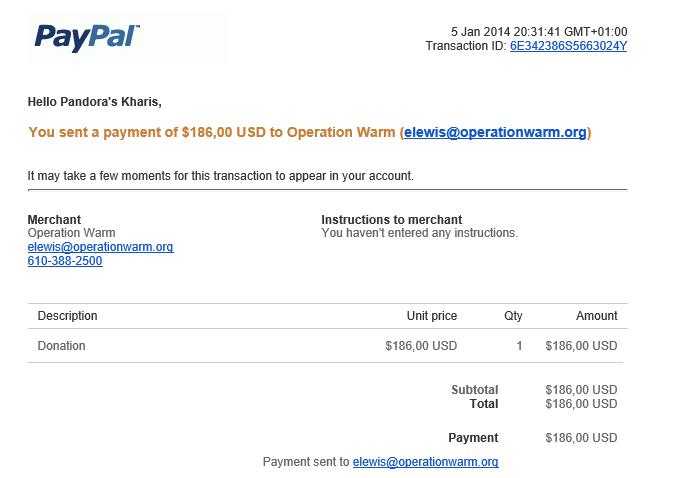 PayPal takes its standard fees from the transactions--in this case about $10,-, which was covered by Elaion, making sure every cent of your donation went to the Foundation to buy coats for kids who are struggling in this winter weather. The average amount paid by the contributors was around $15,-, with donations coming in as high as $30,-. Giving a child a new coat positively impacts that child’s self-esteem and self-worth. Coats For Kids believes that the impact on kids that receive coats from CFK is dramatic, as evidenced by heads held high, smiles, and fewer missed days of school because of illness. Most kids that receive a coat from CFK either have never had a winter coat or, at best, have had a hand-me-down from a parent, sibling, or clothing box. On average, a new coat costs the Foundation fifteen dollars, meaning that together, we have been able to provide good, sturdy, warm coats to twelve kids who are in desperate need of them this winter.